I thought that I was still in my home preparation, but somehow the lines I prepared at home I didn’t like. That’s why I invented this Qb6 move, which is certainly a move in the wrong direction! As Alexandra pointed out, 36.Kf1 now would have allowed the beautiful finish 36…Qxg3!! 37.fxg3 Nxg3#, but after 36.Kh2 Nxg3 White simply resigned. 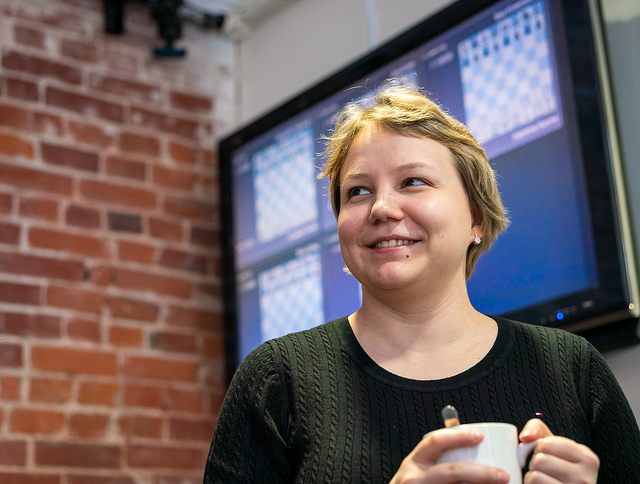 The other game to match that drama was Gunina-Khotenashvili, where both players burnt up an enormous amount of time in the opening, though things got really strange after 18.Bxh6! Bela Khotenashvili thought this was impossible due to 18…Ne5?, but then realised that runs into 19.Rxe5! Rxe5 20.Qxa8. Simply playing 18…Rxe1+ 19.Rxe1 Re8 gives Black a decent position, though. Instead she went from 29 minutes on her clock to just over a minute before playing 18…d3? !, and soon, playing on increment, her position crumbled. 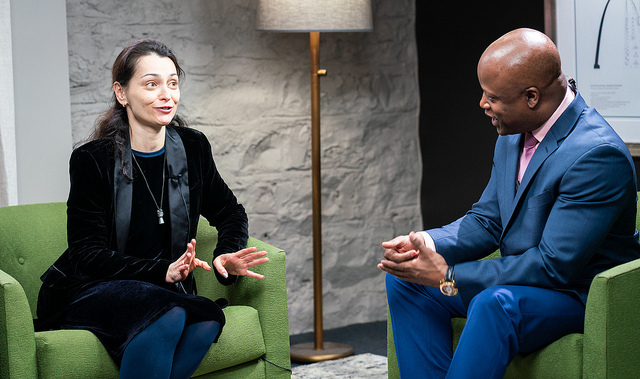 Valentina Gunina’s direct and aggressive approach to converting her advantage may not exactly have been optimal, but it got the job done. 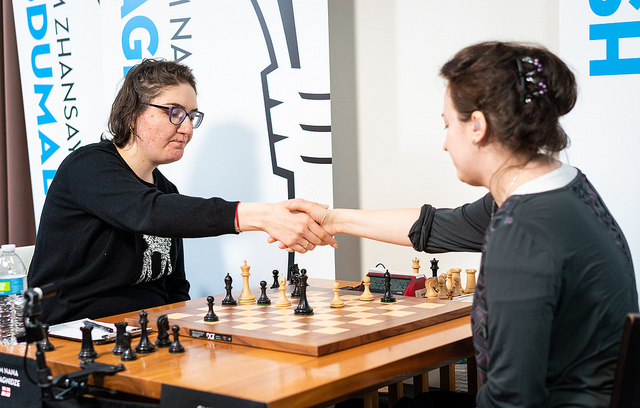 Harika Dronavalli vs. Marie Sebag was a well-played draw, while the other two decisive games saw the player with the black pieces use the bishop pair and passed pawns to grind out a win. 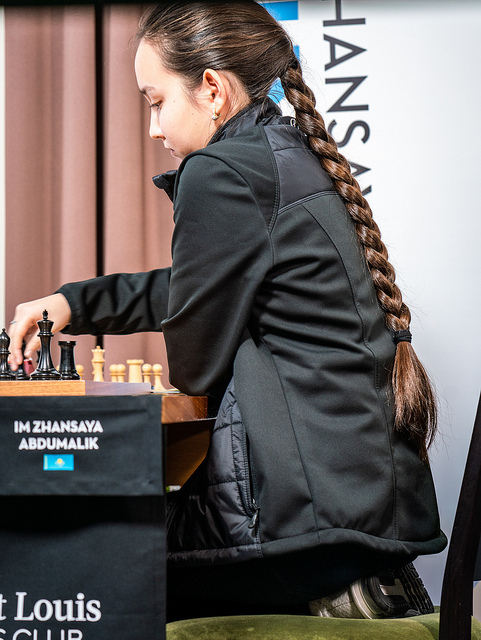 19-year-old Zhansaya Abdumalik played a novelty on move 15 of some Grünfeld theory against Anna Zatonskih, but by that stage it seems both players were out of book. Anna felt she had a chance to get “a big advantage”, but it seems she overpressed and was ultimately punished by her young opponent. Anna commented, “I prepared too much before the game and got tired and couldn’t calculate variations”. 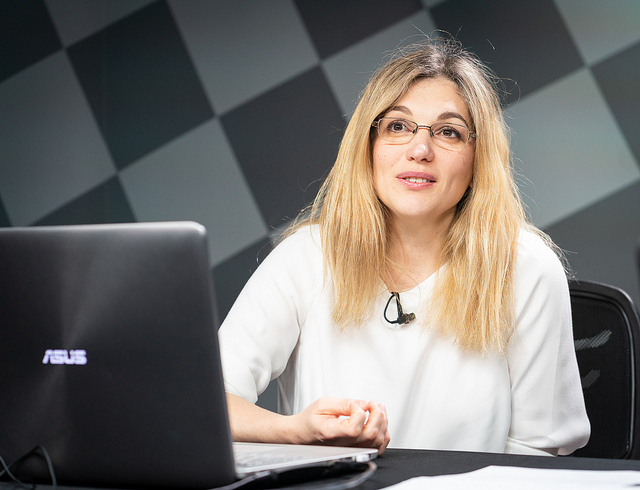 There was some good news for local US chess fans, however, as Irina Krush came through to beat Nana Dzagnidze in the longest game of the day. Black had a nagging edge from early on, but Nana had chances to hold before finally falling to defeat in 69 moves. 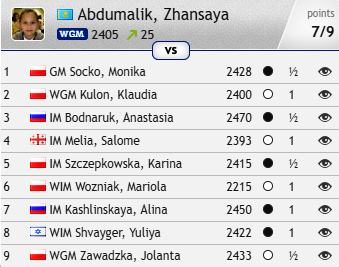 In Round 2 it’s USA-Russia as we get Krush-Gunina and Kosteniuk-Zatonskih! 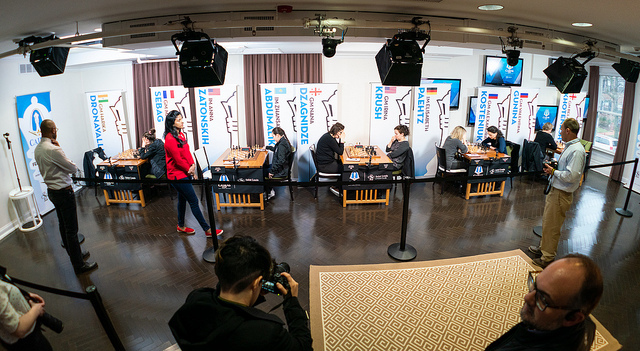 Follow all the action live from 13:00 in St. Louis (20:00 CET) live here on chess24!